As a forager with access to large amounts of uniquely fragrant cow parsnip (Heracleum maximum), you may be at a loss with how to make use of this wild edible plant. I'll eat a batch or two of the greens when they are young, though they're not something I'd want to eat every day. I far prefer to use the seeds of cow parsnip. They are pungent with celery, citrus peel, rain, and tobacco flavors, and a quality that feels nearly electric on my tongue. 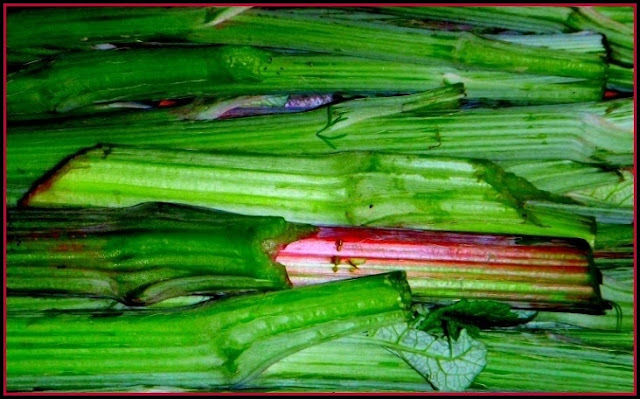 For many years, I tried to use two of our local angelica species (Angelica spp.) in place of the angelica (golpar) called for in many of my favorite Persian recipes. However, something was off. The flavor was a miss, not even coming up to the same level of flavor as dusty commercial golpar. I don't know what took me so long to look up which species of angelica actually grows in Iran. It was with excitement that I read it was Heracleum persica, a close relative of my own local cow parsnip, Heracleum maximum. Sure enough, cooking with cow parsnip seeds vielded that familiar golpar flavor I'd been missing. I excitedly told a few of my local Persian friends about my discovery, and they gave a collective, "well, duh!" Ha. Of course. I think this story demonstrates nicely why it important to know plants' botanical names, not just common names. Cow parsnip belongs to the family Apiaceae. Although this plant family is generally not considered a good choice for novice foragers because it also contains some highly toxic plants like poison hemlock and water hemlock, cow parsnip has distinctive leaves. The leaves of cow parsnip are large and lobed, whereas the leaves of poison hemlock (Conium maculatum) resemble those of carrots, and those of water hemlock (Cicuta spp.) look more like marijuana. 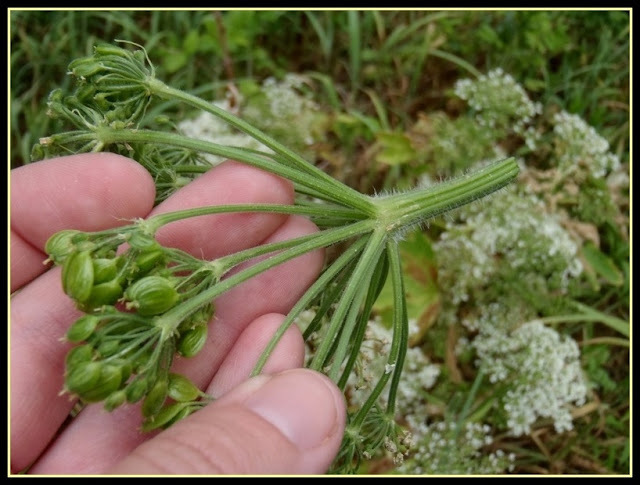 Carefully identifying a plant before consuming it is always the golden rule of foraging, even more so with an plant in the Apiacea family. Additional caution must be used because cow parsnip contains furocoumarins, which can cause a blistering rash in combination with sunlight. I have not had this happen to me personally, but as a precaution, I always pick cow parsnip with my hand and arm covered, or simply wait until the end of a hiking trip to harvest. I like to pick cow parsnip seeds just after they've peaked, but before they've significantly dried on the plant. In our mountains, this is usually around the same time as the end of porcini season in mid-August. Click here to see more pictures to help you with identification of cow parsnip (Heracleum maximum). My foraging buddy Wild Food Girl has also written about cow parsnip. My favorite way to use cow parsnip seeds is to sprinkle their powder over freshly cooked fava beans, a preparation that is solidly Persian. I enjoy fava beans so much this way that if they're served any other way, it feels as if something is missing. Additionally, eating fava beans in this manner is best done as a social activity, everyone sharing a big bowl of beans, licking salt and "angelica" from their fingers. Small fava beans can be eaten whole. Especially large pod can contain beans that will cook up to a mealy consistency. To my mind, the best fava beans are those that come from medium-sized pods. This means that the precious beans will still be squeaky tender, like a giant fresh pea. 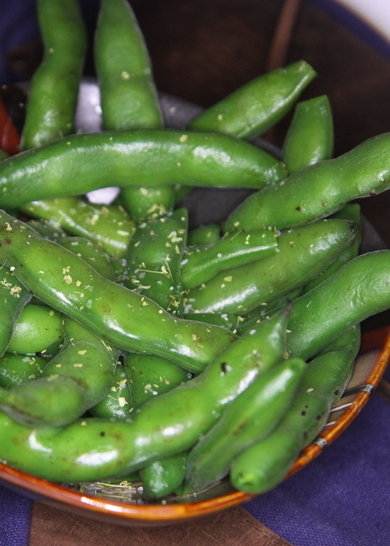 If you can't find fresh fava beans, they can sometimes be found in the freezer section of your grocery store, labeled either as fava or broad beans. Here are a few more recipes in which you can use cow parsnip seeds. 1. Steam the whole fava beans from 5-7 minutes. Test one at 5 minutes to make sure it is cooked to your liking. 2. While the whole fava pods are still warm, sprinkle them with the cow parsnip seed powder and flakes of salt. 3. 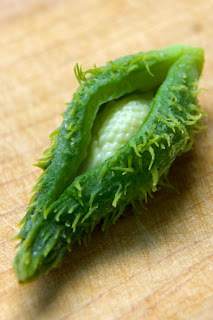 Share the steaming hot fava beans immediately, being sure to first open up the outer pod, then remove the thick skin from around the beans before enjoying them.